Property 6: Villa Vaggelio, Panoramic Views in Total Quietness, Close to the Beach & City! Property 16: Rosemary Villa! 45m2 pool, large terrace, walking distance to shops! Property 19: Stone Built Cottage House in the Nature with Spacious Gardens and Full Privacy! Villa Kosta Mare, 50m2 pool, heated jacuzzi, walking distance to shops! Property 30: Villa Kosta Mare, 50m2 pool, heated jacuzzi, walking distance to shops! Property 33: Afroditi Villa, goddess Of Beauty And Pleasure In Cretan Nature! Property 35: You relax while we take care of you - Read our reviews and book now! Property 40: You relax while we take care of you - read our reviews and book now! 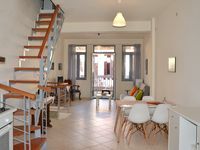 Property 41: Traditional stone villas in Rethymno, Crete. Casa Di Ilianna! Walking distance to beach! Car free holiday! Children's pool! Property 50: Casa Di Ilianna! Walking distance to beach! Car free holiday! Children's pool!